Which States Share Their Name With a U.S. River? Southwest Pass, the primary entrance to the Mississippi River. Learning the origins of names is always interesting, and the 50 states of the United States have some very unique names. Can you count how many states share their name with a river? If we count only natural rivers in the U.S., the total is 15 and the majority of the states were named after their respective rivers. The 15 states that share their name with a river are Alabama, Arkansas, Colorado, Connecticut, Delaware, Illinois, Iowa, Kansas, Kentucky, Minnesota, Mississippi, Missouri, Ohio, Tennessee, and Wisconsin. In most cases, the names have a Native American origin. Additionally, California is also the name of an aqueduct (an artificial river), Maine is also a river in France, and Oregon was an old name for the Columbia River. Runs southwest through the state of Alabama, beginning just north of Montgomery. Flows into the Mobile River north of Mobile. The Alabama River is 318 miles (511.7 kilometers) long. The name Alabama derives from the name "Alibamu," a Native American tribe from the area. Runs east-southeast through four states, from the Rocky Mountains in Colorado to the Arkansas-Mississippi border. Flows into the Mississippi River. The Arkansas River is 1,469 miles (2,364 kilometers) long. The name Arkansas comes from the Quapaw (or Ugakhpah/Arkansaw) Indians and means "the people who live downstream." Runs southwest through five states, beginning in Colorado's Rocky Mountains and through the Grand Canyon. Flows into the Gulf of California in Mexico. The Colorado River is 1,450 miles (2,333 kilometers) long. The name Colorado comes from a Spanish word used to describe something that is "colored red." Spanish explorers gave this name to the river because of the red silt it contained. Runs south through four states, beginning at the Fourth Connecticut Lake in New Hampshire, just south of the Canadian border. Flows into Long Island Sound between New Haven and New London. The Connecticut River is 406 miles (653 kilometers) long, making it the largest river in New England. The name derives from "quinnehtukqut," meaning "beside the long tidal river." The river was called this by the Mohegan Indians that lived in what is now Connecticut. Runs south from New York state and forms the border of Pennsylvania and New Jersey. Flows into the Delaware Bay between the states of Delaware and New Jersey. The Delaware River is 301 miles (484 kilometers) long. The river was named after the Lord of De La Warr, Sir Thomas West, the first governor of the Virginia colony. Runs southwest from where the Des Plaines and Kankakee rivers meet near Joliet, Illinois. Flows into the Mississippi River on the Illinois-Missouri border. The Illinois River is 273 miles (439 kilometers) long. The name comes from the Illinois (or Illiniwek) tribe. Though they called themselves '"inoca," the French explorers used the word Illinois. It is often thought to mean "tribe of great men." Runs southeast through the state of Iowa, beginning in the north-central part of the state. Flows into the Mississippi River on the Iowa-Illinois border. The Iowa River is 323 miles (439 kilometers) long. The name comes from the Ioway Indian tribe and the river's name led to the state's name. Runs east-northeast through the state of Kansas, beginning in the east-central part of the state. Flows into the Missouri River at Kansas City. The Kansas River is 148 miles (238 kilometers) long. The name is a Sioux Indian word that means "people of the south wind." The Kansa Indians lived in the area and French explorers were the first to put the name on a map. Runs northwest through the state of Kentucky, beginning near Beattyville. Flows into the Ohio River at the Kentucky-Indiana border. The Kentucky River is 259 miles (417 kilometers) long. The origin of the name Kentucky is up for debate, though most sources reference various Indian languages. It has been interpreted as both "the land of tomorrow" and "plain." The area has been called Kentucky since it was part of the Virginia colony. Runs southeast through the state of Minnesota, starting at Big Stone Lake. Flows into the Mississippi River near St. Paul. The Minnesota River is 370 miles (595.5 kilometers) long. The name was given to the river before the state and is often interpreted as a Dakota word meaning "sky-tinted (or cloudy) water." Runs south from Lake Itasca, Minnesota. It touches or runs through a total of 10 states, often acting as the border between states. 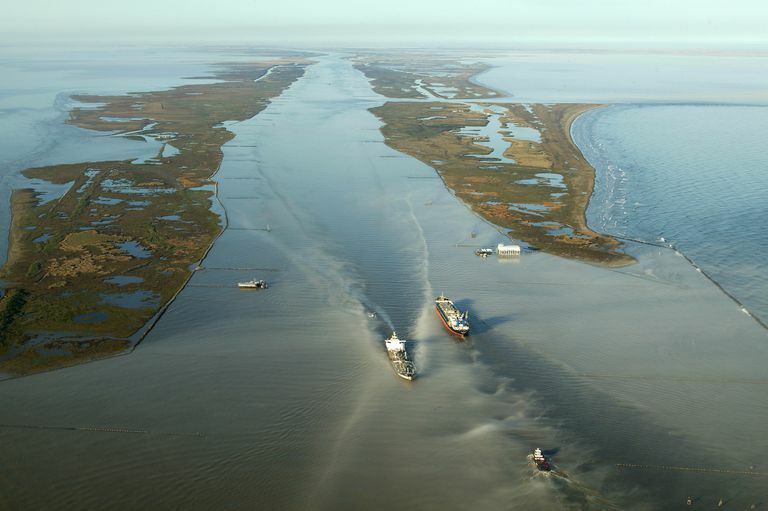 Flows into the Gulf of Mexico in New Orleans. The Mississippi River is 2,552 miles (4,107 kilometers) long (some official measurements state 2,320 miles), making it the third longest river in North America. The name was given to the river and is an Indian word meaning "the Father of Rivers." The state received the name because the river makes up its western border. Runs southeast from the Centennial Mountains in Montana through seven states. Flows into the Mississippi River north of St. Louis, Missouri. The Missouri River is 2,341 miles (3,767 kilometers) long and is the fourth-longest river in North America. The name comes from a tribe of Sioux Indians named the Missouri. The word is often interpreted to mean "muddy water," although the Smithsonian Institution Bureau of American Ethnology interprets it as "town of the large canoes." Runs west-southwest from Pittsburgh, Pennsylvania and forms the borders of six states. Flows into the Mississippi River at Cairo, Illinois. The Ohio River is 981 miles (1,578 kilometers) long. The name Ohio is attributed to the Iroquois and means "great river." Runs southeast from Knoxville in the east-central part of Tennessee. The river dips into the northern part of Alabama before changing course to the north through Tennessee and Kentucky. Flows into the Ohio River near Paducah, Kentucky. The Tennessee River is 651.8 miles (1,048 kilometers) long. The name is often attributed to Cherokee Indians and their villages of Tanasi, which were along the river's banks. Runs southwest through the center of Wisconsin, beginning at Lac Vieux Desert on the Wisconsin-Michigan border. Flows into the Mississippi River south of Prairie de Chien, Wisconsin on the Wisconsin-Iowa border. The Wisconsin River is 430 miles (692 kilometers) long. The name is of Indian origin, though the meaning is debated. Some argue it means "the gathering of the waters," while the Wisconsin Historical Society notes it as the "river running through a red place." What Makes a Brook Different from a Stream and a Sea from an Ocean? Can You Guess These State Nicknames?